Costa Rica - green and happy? Whatever the outcome of the presidential elections on Sunday, one thing seems certain. The country will continue to break the mould. Central America is a region still associated with coups and civil strife, but Costa Rica has no army. It was abolished in 1949. Successive governments have poured money into books, not bullets. Not even the recent threat of the Mexican drugs war spilling over has led to calls for the army's return. It was also the first developing country to state its aim of being carbon neutral (by 2021), in part through the mass planting of trees. Official figures suggest that it has bucked the trend of losing its forests: more than half its territory is now covered in trees, compared to 20% in the 1980s. And then there's Costa Rica's reputation for being one of the happiest and greenest countries in the world. It regularly appears top - or near the top - of international surveys. It is usually the only developing country to do so. The 2010 Environmental Performance Index was published last month by experts at Yale and Columbia Universities. Using 10 categories and 25 different measurements, Costa Rica was placed third out of 163 countries, up from fifth two years ago. Only Iceland and Switzerland outperformed it. The UK came 14th, the US 61st. "Things aren't perfect in Costa Rica," Christine Kim from Yale University told the BBC. "But basically the country does care about the environment. Other governments shove it down towards the bottom of their priorities." The latest version of the Happy Planet Index compiled by the New Economics Foundation (NEF), placed Costa Rica on top of every country in the world. It makes an explicit link between happiness and the environment, and combines three key variables - what people say about their life satisfaction, their longevity and their ecological footprint. Costa Ricans have a high life expectancy - 78.5 years - and a low ecological footprint, although the NEF says it still needs to do better. Some analysts question the validity of such international surveys, in part because they rely on self-reported happiness. And some non-governmental organisations, like COHA in Washington, question Costa Rica's green credentials when the government recently allowed a Canadian company to start open cast mining for gold. But greenness does seem to permeate both public policy and the private lives of Costa Ricans. The country pioneered a carbon tax in 1997 which is used in part to pay landowners and indigenous communities about $65 (£41) a hectare not to chop down trees. Well over 90% of its energy supply comes from renewable sources. Representatives from the business community, churches, diplomats, and farmers say they follow green policies, either voluntarily or because of the law. "Every time I construct any new building, I have to get a certificate from the national environment office that I am not damaging the environment," says Juan Francisco Montealegre, who owns a construction company. "For example, they have to be sure sewage will not contaminate nearby rivers." "I am very aware of my carbon footprint," says Pilar Saborio, Costa Rica's ambassador to the UK. "President (Oscar) Arias has asked cabinet ministers, vice-ministers and heads of government institutions to offset their flights out of their own pocket." Bishop Melvin Jimenez, from the Lutheran Church, told the BBC it was his church's policy to support a range of green initiatives, including "ecological sanctuaries" where congregations learn to grow crops, including medicinal plants, in an environmentally sound way. "I have my own organic garden where I grow carrots and other vegetables, I recycle and I use the car as little as possible," he says. Ricardo Ulate, a cattle farmer and adviser to the government on climate change, says that in the past 10 years he has planted trees on what was pastureland to improve the biodiversity on his farm, and has given up one of his two cars. But does this "greenness" make Costa Ricans happier? "Yes," says Mr Ulate. "Now I have a simpler, less materialistic life, more in tune with nature." "We don't have a sensation of death," says Mr Montealegre. "Nothing is arid here, you can see life everywhere." He points out that Costa Ricans often answer the question 'How are you?' with the phrase "pura vida". It literally translates as "pure life" but roughly means "cool" or "everything's fine". But amid such upbeat views, Bishop Jimenez is more circumspect. "I cannot be happy when the number of poor people is increasing," he says. "And when the government is allowing open pit mining and exercising no control over multinationals growing melons and pineapples. International studies show they are using excessive amounts of agrochemicals." Analysts say that Costa Ricans' apparent happiness could be down to a whole series of factors in addition to greenness: strong social networks of friends, families and neighbours; ubiquitous social and education programmes; and tolerance of social divisions and different opinions. Mr Montealegre says there is another factor. "A popular piece of philosophy in Costa Rica says no argument or quarrel should last more than three days," he says. 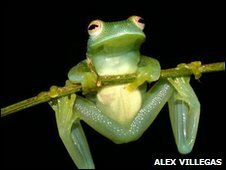 What next for Costa Rica's frogs?